Flappy and Scrappy are friends—the kind who know just what to say when one feels sad. They’re the kind of friends who will play, even when they don’t really want to, just to make the other happy. They are the kind who never forget a birthday. What kind of friends are they? Best friends. Beautifully portrayed by the Ivanovs’ expressive watercolor, Arthur Yorinks’ canine pals have an unforgettable friendship. This book has three stories split into three chapters. You’ll find a Table of Content at the very beginning of the book. Explain to your child that books have chapters or sections to divide the story; the topics may be different but the characters remain the same. Have them go to the table of contents and find each chapter. As you read the book, show them when a new chapter has begun. Good Friends: Where was Flappy going? Who did she meet on the way? Good Friends: Why did Flappy think all her friends were being mean to her? Were her friends actually trying to be mean? Good Friends: What did Scrappy do differently than all the other animals when he saw Flappy? Good Friends: Why is it important not to speak with your mouth full of food? Play Ball: Do you know how to play catch? Do you like to play? Play Ball: What did Flappy’s friends do when they tried to play catch? Play Ball: How do you think Flappy felt when her friends kept getting distracted? Play Ball: Who threw the ball first? Who caught the ball? A Birthday: Would you feel the same way Scrappy felt about his friends not wishing him a happy birthday? Why? 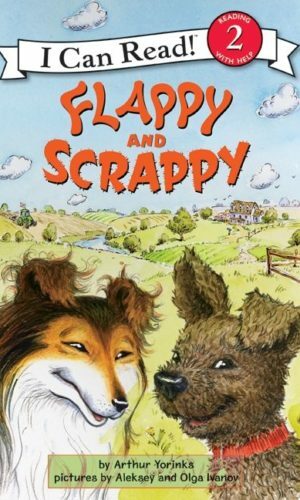 A Birthday: What happened when Flappy and Scrappy tried to visit their friends? A Birthday: Did Flappy know it was Scrappy’s birthday all along? A Birthday: What happened once they both arrived at Flappy’s house?